Aside from “Sedrick is the worst guardian ever.” You already knew that. Rather rude explanation about why said opinion is wrong. Apology for previous comment and excuse for rudeness. (Something along the lines of “It was really late” or “I had a headache”). Refrence to TvTropes about why it’s not nonsense. What did I learn, well, Hildeburh plays dating sims on a pink hand-held computer system thing. 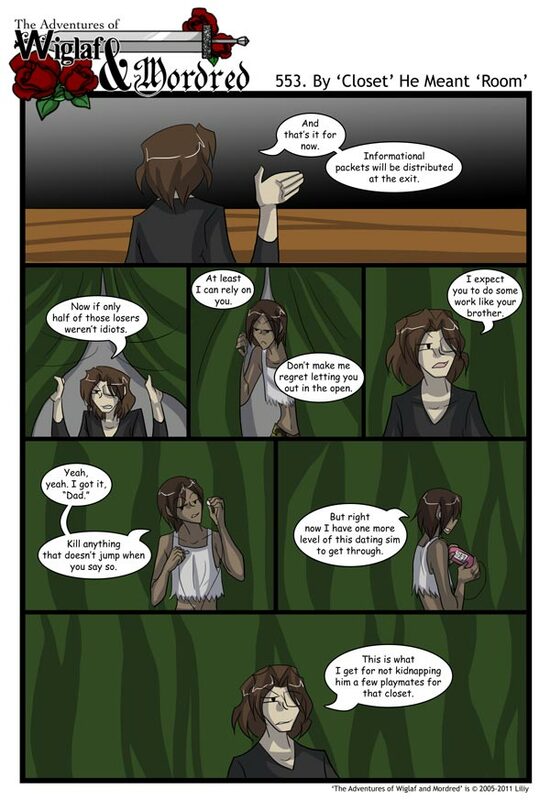 And that Sedrick’s hand looks very funny in the first panel. I learned that Sedrick allows Hildeburh to call him dad, and also that Hildeburh has no ‘t’ in it. Ah, a weak link. Very sloppy, Sed. You’re not supposed to have vulnerabilities close to you that can be exploited. Ah, this will be fun. Heh heh heh. “Room,” Huh? Shall I assume a something along the lines of 10′x10′, Concert brick walls, a cot, a toliet, and a sink? No windows of course. Oh And don’t forget the slot in the door for food trays. Or was the poor boy treated a bit better? Ah! I got it! I think I got it! Sedrick is Wiglaf’s Parent’s Son! the one child They DID have together! Wiglaf and his sister were from a different father! What is the natural Parents had a baby and Sedrick was the end result?? He’s strong enough to take on Arthur AND Janus like Wiglaf, (I know this is a bit shallow but) their genes seem to match so far and we know whose parents everyone else belongs to, and they BOTH were servants to the garrotts! Wiglaf was a Stable Boy for Mr. Garrott turned Servant for Mordred and Sedrick worked for Arthur! That, actually makes a scary amount of sense. I learned Hildeburh was possibly raised by Sedrick. I mean…for longer then Hnaeff was. I learnt that Sedrick’s shortness and lack of a second eye seem to render him incapable of accurately judging the amount of space needed for a growing boy to ..grow in. I learned that Sedrick likes to employ kids with unpronounceable names. Hnaef has a brother…? I mean, I noticed the immense similarities last comic, but….wow. And he’s just as sucked into his video antics as Hnaef is. It makes him seem slightly less intimidating, but I’m not gonna be hugging him anytime soon. I learned that Sedrick already has a crew of lowly interns doing his bidding. Who else would’ve photocopied and stapled all those packets? I learned that I can only think of 25 ways to kill a person with toothpick even given superstrength before they start becoming samey.